Here is a special holiday toy that both children and adults will enjoy. 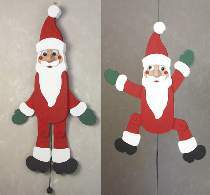 Pull the string and watch Santa's arms and legs move, and his eyes roll. Great conversation piece for holiday entertaining. Santa measures 27"H. All patterns drawn FULL SIZE. Order hardware parts package separately or SAVE with the Special Offer which includes the plan and hardware. Pull-String Santa Hardware Parts Package Includes string, half balls for Santas eyes, doweling, screws and 1/4" plywood to build one toy. Project plan, and paint are not included.